Having your own laptop is no big deal these days. If truth be told, after buying a laptop, one probably spends lots more money on software and accessories. If you are always on the lookout for a new accessory for your beloved laptop, then here is something that you might want: Sony’s new 3D sheet. While 3D is being touted as being a big thing, it really has not made it to every household that has a TV or a computer yet. You have to admit that watching certain movies in 3D is awesome, but there is the fact that having to wear 3D glasses is such a pain. How does it work? The 3D sheet is placed over the screen of a Vaio laptop. The laptop’s camera takes note of the position of the viewer’s head, and using face detection technology, the system ensures that the 3D images are maintained even if the viewer moves. This is actually one of the issues that glasses-free 3D systems have. Hopefully, with Sony’s technology, there will be more freedom of movement so that you don’t have to worry about jerking to the left or right during a particularly thrilling part of a movie. What I am not sure about is whether the system allows for the tracking of more than one viewer – making sure that everyone looking at the screen can still images in 3D. Then again, if you are using a laptop, the chances are that you won’t have your entire family watching with you. That’s what we have huge TVs for, after all. Another issue is that the 3D sheet is made for the Vaio S series. If you use a different brand, then it’s probably useless. 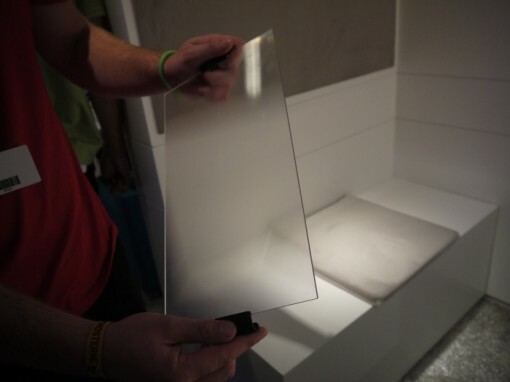 The 3D sheet will be released in Europe in October with an expected price tag of $183. The Vaio S series will be released at the same time around the $1000 range. As for me, I’m content with watching 3D movies in the theaters when they come out.